The March meeting of the HPMS was called to order at 7:05 P.M. on 4 March. There were 12 attendees. The minutes of the February 2019 meeting were read and approved. The chapter has received notice from IPMS national that our chapter charter has been renewed. A new banner design for our yearly contest is still in the works. The subject of revised contest forms for our yearly show is still in process. 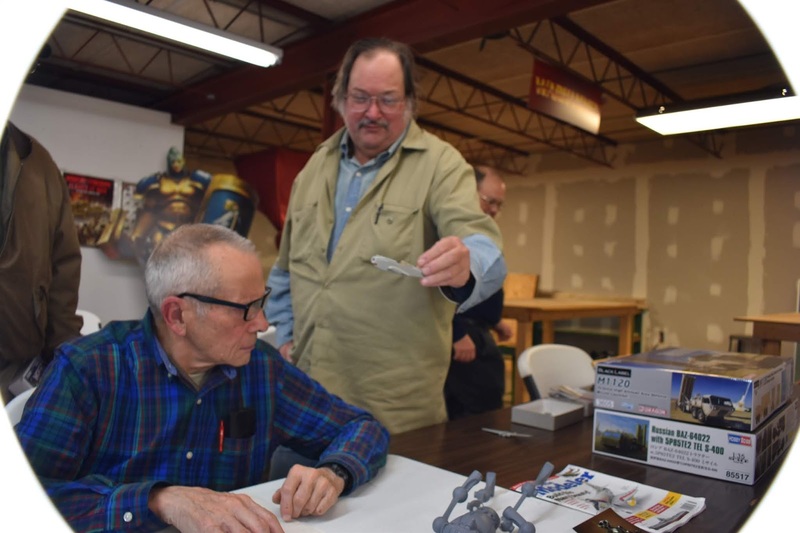 Tom Clark briefed the chapter on the Atlanta figure modelers figure show. Basically a good show, some interesting items on display. The update of our show contest rules will be sent to chapter members. During the course of a review of our existing rules it was discovered that we had no rule regarding models that had won in shows conducted by other chapters. The subject of advertisements for our model show and contest was brought to the floor. Tom Clark said he would look into this and provide updates. The tenor of the meeting changed as we talked about the passing of Ed Maslin, our previous president of the chapter. Our current president Andy Brezinski had talked with Ed's family and gave us a briefing on his passing. There was discussion on how to honor Ed. During the course of the discussion it was mentioned that late last year, after we had held our model show and contest, Tony Campbell had passed away. After further discussion the motion was put forth to have an award, in Ed's name, for a kitbashed/custom model in any category at this years show and contest and also that this years Best Aircraft award would carry Tony Campbell's name. This motion was approved by the chapter members present. Tom Clark attended the Atlanta AMPS show and came away with two gold and one silver medallion for the models he entered. Good work!!!!!! He also took a gold medal in the Atlanta Military Figure Show. The last item to be discussed at this meeting regarded the chapters trophy package to the IPMS National Convention at Chattanooga. As it stands right now we sponsoring one package to honor the 50th anniversary of the Apollo 11 moon landing. We will judge the models related to this event and will provide the trophy. We had originally talked about sponsoring two packages. 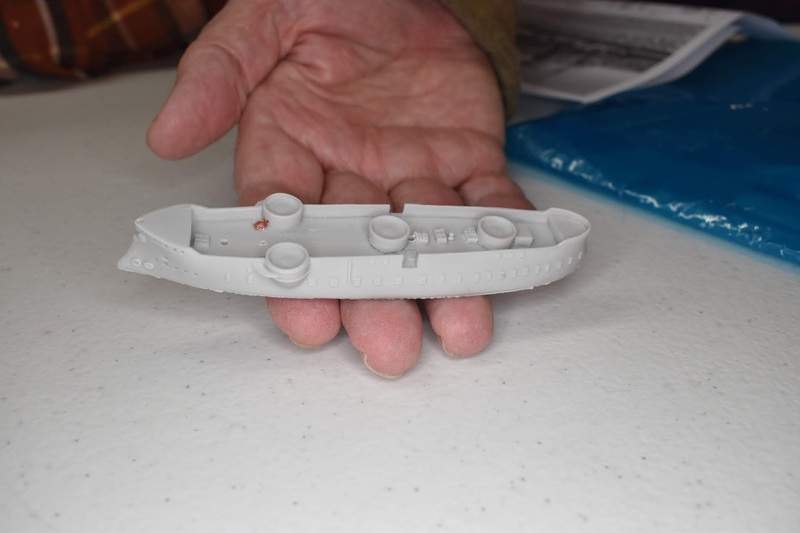 The Anniston model show and contest is the first week in April,2019. Wonderfest is projected for the first week in June, 2019. The March 'Build Night' will be 18 March, 6:00 P.M. to 8:00 P.M. at The Deep Game and Comic Book Store. Tom Clark - 1/24th scale 2006 Chevy Corvette ZO6. Experimenting with painting a car using the same painting style as a tank - the "modulation" paint style. Showed parts from the Apollo 27 project - rocket nozzle from a champagne flute and "radiation shield" from plate & saucer. Also new "RZ" breathing mask. Rick Nelson - Scratch built 1/18 scale C-130 cockpit as part of a flying model. Bruce O'Gorman - 1/35th scale NASA M-113 Fire Rescue Vehicle and NASA Experimental Hazmat Response Vehicle. WIP Nasa M-113 - Homemade decals; modified Tamiya M-113 A1/A3 kit. Scratch built antenna and rear speaker. WIP NASA X HRV-1. Homemade decals, modified Tamiya M-577 command track vehicle. Scratch built hydraulic arm, dozer blade, camera mast, drone, and interior. Plan to light with LEDs in interior and light bar. Ken Denza - 1/24th scale modified Cavalier stock car. Body is resin from Big Donkey resin. Also wired engine, and added fuel line. Wheels & tires are Plastic Performance items. 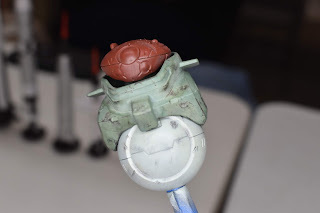 Paint is Tamiya Italian Red and Chrome Yellow. Scratch built crash bars, billet aluminum fire extinguisher and radiator cap. Additional wiring included tachometer and battery. Barbara Denza - 1/25th scale 1964 Chevy Pick-up Truck. Tamiya Pearl White & Bright Orange. Ran fuel line, flocked interior, added seatbelts, wired engine and alternator. Bill Nichols - a Ford Trimotor as the centerpiece to a diorama based on the H. P. Lovecraft story "The Mountains of Madness." With giant albino penguins! Martin Burkey brought some 3D printed parts for the AMT/Round 2 "Man in Space" set, that replace the original capsules with more detailed alternatives. It is with great sadness that we announce the passing of our friend, colleague and former chapter president, Ed Maslin. 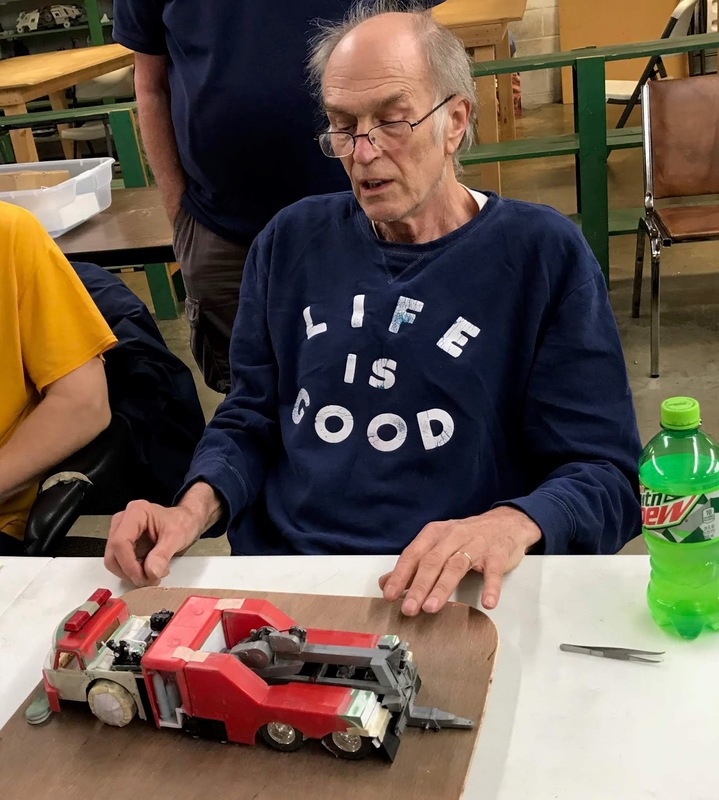 Ed was a man of wit, inventiveness and humor, and always looking for ways to improve and innovate in his hobby. He passed away February 2, 2019 in Decatur, AL. The February 2019 meeting of the HPMS was called to order at 7:05 P.M., 4 February. There were 15 attendees. The December 2018 were read and approved with corrections and additions submitted the chapter president noted. 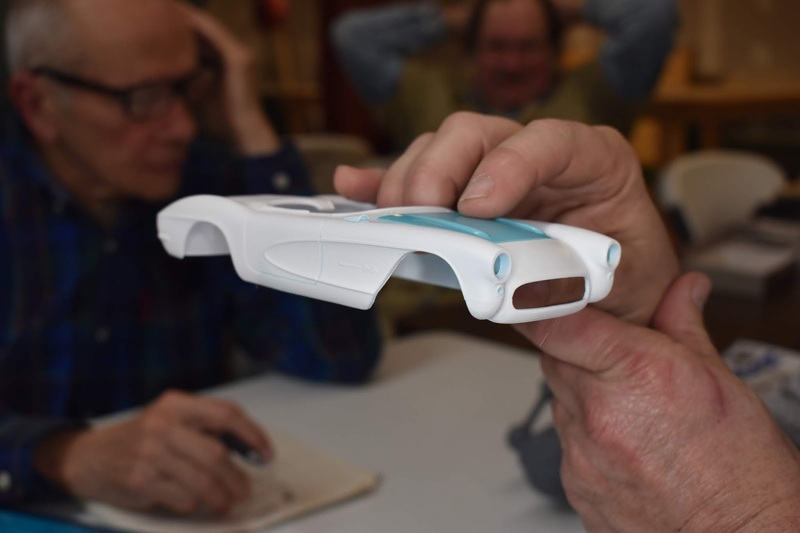 There was no formal January 2019 meeting as January is the chapter's yearly swap meet. Tom Clark mentioned that he not received a reply from IPMS national regarding the chapter renewal. Since our funds are in good shape it was decided that we allocate $800.00 to donate to charity functions such as 'Toys for Tots'. The subject of new banners for our chapter contest is still being pursued. During the course of the Chattanooga chapter show members of our chapter discussed with Chattanooga chapter officials the 'special category' criteria. There was mention that our chapter will have to provide the trophy for this category, Tom Clark said he would do research on this. There was the suggestion that we find a way to mention NASA during the presentation. The subject of our contest forms was brought up. 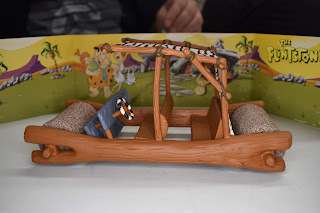 There were suggestions such as having a place to check for 'special category', eliminating the two piece form, basically giving entrants two forms to fill out, and redesigning to form such that the entrants name will be visible without having to move the model off the form. The decision was that a copy of the current form will sent out via E-mail to chapter members to generate discussion. 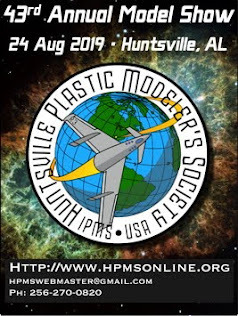 There will be flyers for our chapter show presented at Chattanooga during the IPMS National convention. Our chapter show will shortly after the IPMS National and there was discussion about changing the show date. The final decision was to leave our show date where it is at. The Atlanta figure modelers show is 15-17 February. Chuck Segars - 1/32nd scale Hasegawa P-47D. WIP, modeling the aircraft flown by Major Tices, ETO area of operations. Bruce O'Gorman - 1/35th scale Tamiya Carrier, Command Post, Light, Tracked, M-577A3. This modified from the Tamiya M-577A1 kit. 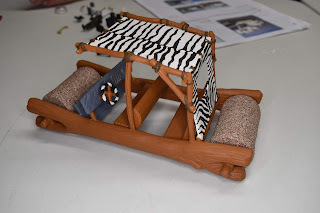 Scratch building interior. This vehicle was an experimental hazmat response vehicle, prototype, at NASA Ames Research facility. 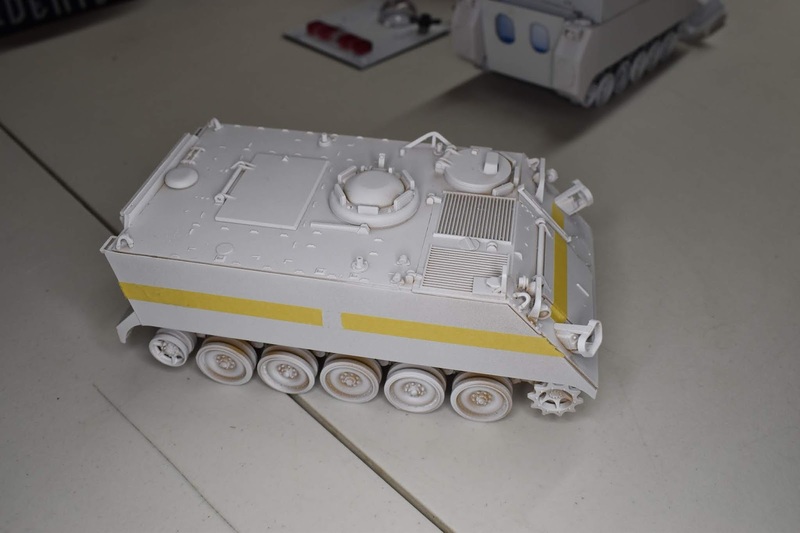 1/35th scale Tamiya Carrier, Personnel,Full Tracked M-113A1. Building this as a astronaut launch pad emergency escape vehicle. This was used during the Apollo and space shuttle programs. Ed Kiker - Scale UNK. 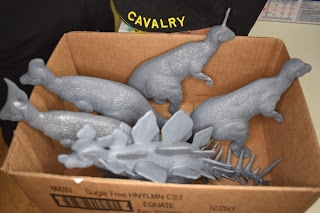 Four species of Hadrosaurus and one fantasy Hadrosaurus. Only one kit of subject available, but nine species of the genus existed. 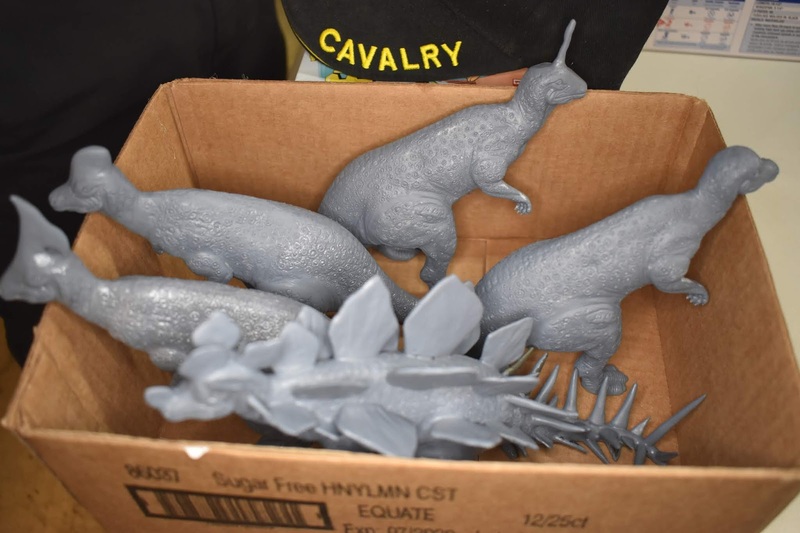 Main difference was in the shape of the head crest. Scale UNK. 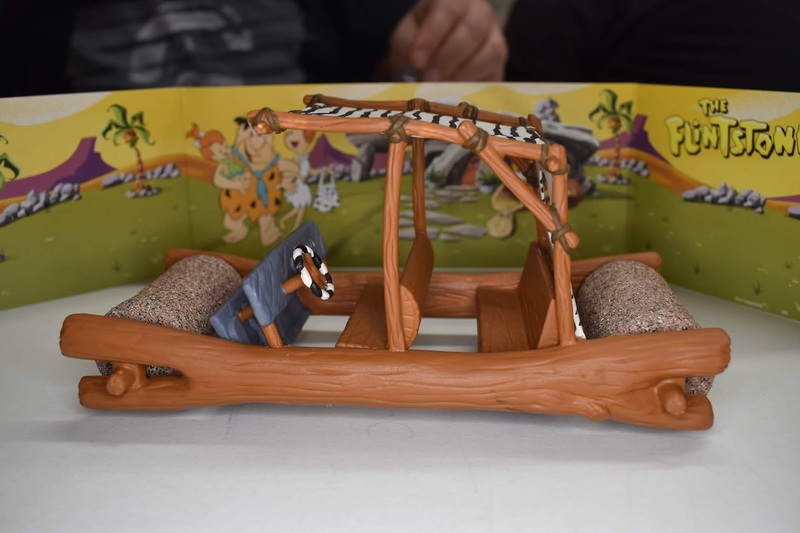 Flintsones' Flintmobile. A break from 'real' modeling, felt I was doing too much. 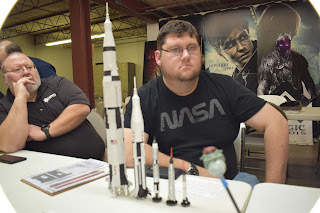 Blake Parker - AMT Man in Space Rocket Collection, scale UNK. Yes, I do build plastic every now and then. Kit is a completely OOB with some after market decals. On the Saturn V rocket, aluminum foil tape used to recreate insulation material on the engines. Tom Clark - 1/72 scale Pegasus Apollo 27(group build). Working on the cockpit and crew figures. Robot, chipping paint. M. E. Mueller - Cutiss H-81 Tomahawk. Basic kit improved, radiators in the intake piece and rear vision cut out. More to come. Curt Haskell - 1/25th scale 57/62 Corvette hybrid. AMT 1957 Corvette front mated to a Revell 1962 Corvette rear. 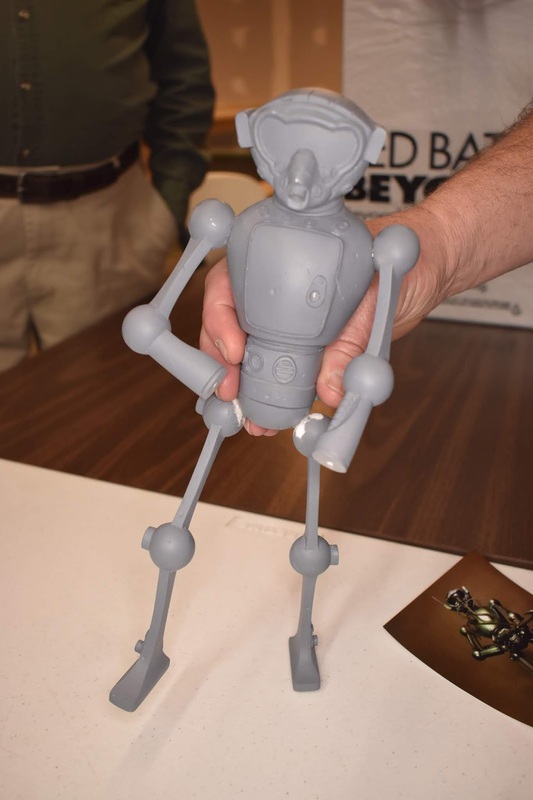 Resin Realities robot kit, scale UNK, scratch building a rockt pack and weapons. 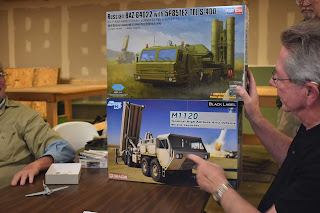 Alphie Onuszkanycz - Two new kits, 1/35th scale Dragon U.S. M-1120 THAAD aie defense system and 1/35th scale Hobby Boss Russian S-400 air defense system. 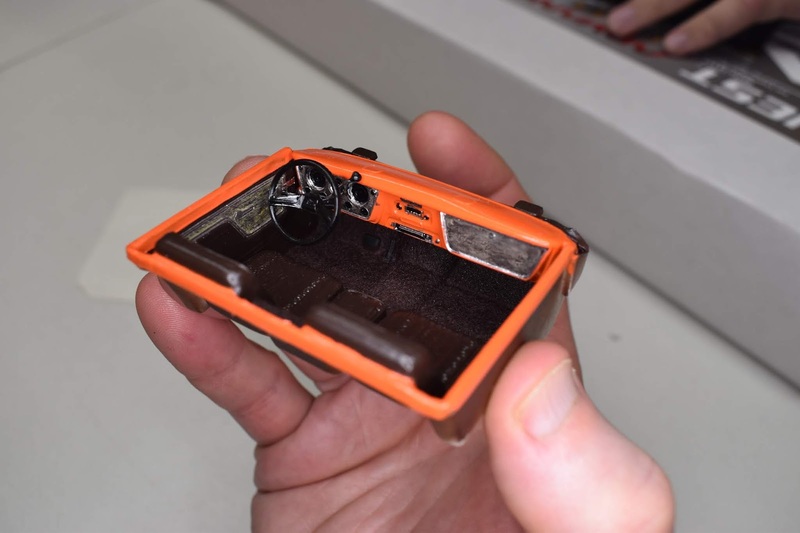 Andy Brezinski - Interior for his 1/25th scale 1972 Chevy pick-up is complete, looks good. Skip Hassler - 1/700th scale French navy ironclad, resin and photo etch parts. 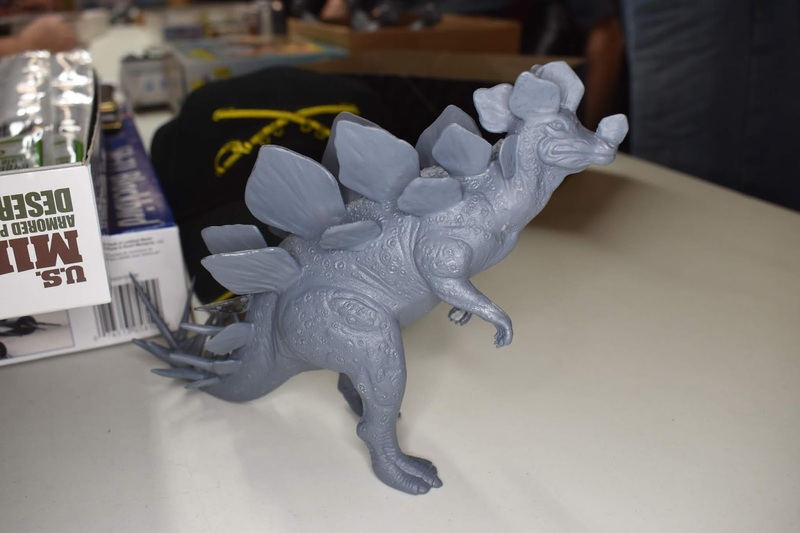 February build night will be 18 February, 6:00 P.M. to 8:00 P.M. at The Deep Game and Comic Book Store.